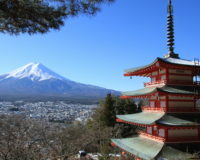 Most people would be familiar with iconic works by Edo ukiyo-e artist Katsushika Hokusai such as the Thirty-six Views of Mount Fuji series or the Hokusai Manga woodblock prints that triggered the Japonisme movement in 19th century Europe. 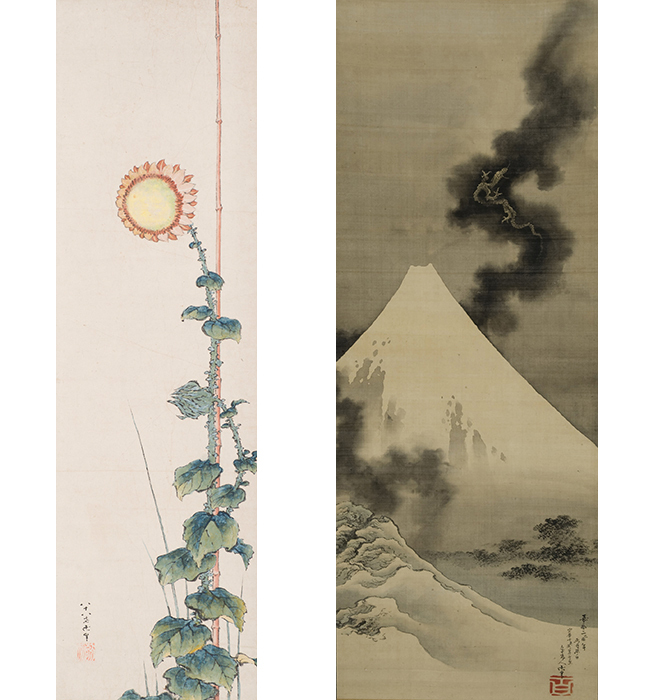 However, these well-known masterpieces represent only a fraction of the paintings Hokusai created during an artistic career spanning some seventy years. The “Hokusai Updated” exhibition at the Mori Arts Centre Gallery in Tokyo draws together around 480 works from Japan and abroad, including recently discovered works and works on public display for the first time, in an effort to draw a complete picture of Hokusai’s artistic career, from his debut at age twenty until his death at the age of ninety. 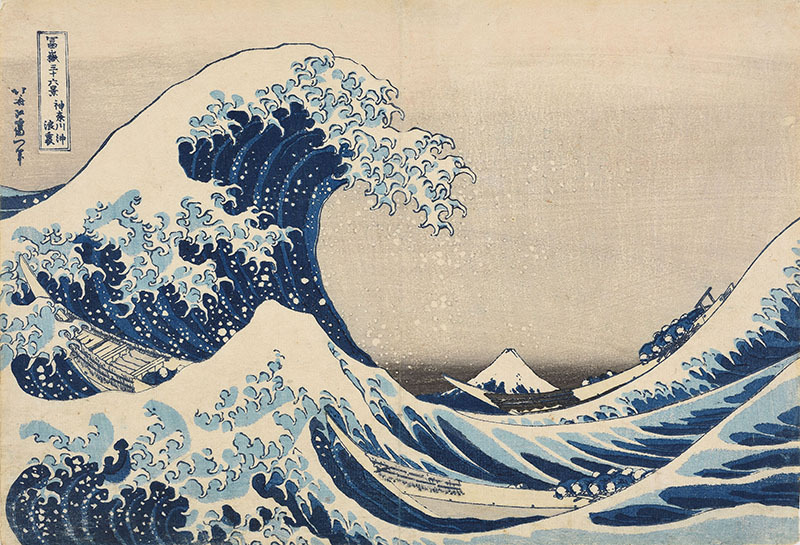 Hokusai used more than thirty pseudonyms during his long career (of which Katsushika Hokusai was just one), many of them marking a distinct change in artistic style. The exhibition is arranged into six chapters, reflecting different artistic phases. The first chapter, titled the Shunrō Period contains works from the ages of twenty to thirty-five, when he followed the Katsukawa School. After leaving the Katsukawa School, he worked on hand-painted works and illustrations for kyōka, books of satirical poetry. 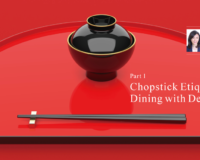 Chapter 2, dealing with works from age thirty-six to forty-six, is titled the Sōri Period. Chapter 3, the Katsushika Hokusai Period (age forty-six to fifty), features pictures he painted for yomihon, a type of illustrated novel. The fourth chapter, the Taito Period (age fifty-one to sixty), features his Hokusai Manga, books containing sample illustrations of everything under the sun. Chapter 5, the Iitsu Period (age sixty-one to seventy-five), features the artist’s numerous nishiki-e prints. The final chapter, the Gakyō-rōjin Manji Period (Gakyō-rōjin Manji translates as Crazy Old Artist) is when the artist devoted much of his time to imaginative hand-painted works that displayed great freedom of expression. Additionally, with a number of works on public display for the first time, such as Sunflower (painting) and Kanadehon Chūshingura (10 small woodblock prints) from the Cincinnati Art Museum, this is a must-see exhibition for any Hokusai fan. to give away. Please see the bottom of this article for details. 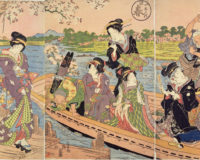 Katsushika Hokusai. 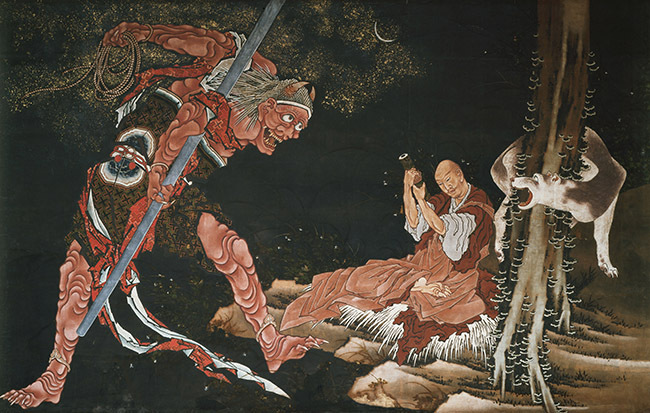 The Priest Kōbō Daishi Exorcising a Demon. Hanging scroll, ink and colour on paper. 1844-47. Nishiaraidaishi Sōji-j Temple collection. Right: Katsushika Hokusai. Dragon over Mount Fuji. Hanging scroll, ink and color on silk. 1849. Hokusai Museum, Obuse. Venue: Mori Arts Centre Gallery. Roppongi Hills Mori Tower 52F. Roppongi 6-10-1, Minato Ku, Tokyo. Hours: 10:00-20:00 (open until 17:00 on Tuesdays). *Entry permitted up to 30 minutes before closing time. Closed: Jan. 29 (Tue), Feb. 19-20 (Tue-Wed), Mar. 5 (Tue). Admission: Adults – 1,600 yen; university and high school students – 1,300 yen; junior high and elementary school students – 600 yen. *Admission fees for visitors with a disability certificate and up to one accompanying caregiver are half the regular admission fee. 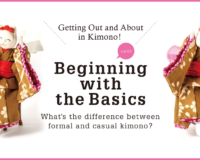 Manabi Japan has five pairs of tickets to give away to our readers in Japan. To enter the draw for admission tickets to the “Hokusai Updated” exhibition at the Mori Arts Centre Gallery in Roppongi, Tokyo, email us at manabi@7oaks.co.jp. In your email, write “Manabi Japan ENGLISH Hokusai Updated Exhibition Ticket Giveaway” and be sure to include your name and your physical address in Japan. ※Entries close on Friday, February 8, 2019. Winners of the draw will receive the tickets by post. The promoter’s decision will be final and no further correspondence will be entered into. For privacy reasons, the names of the winners will not be announced publicly. [ News ] 【Exhibition】 “Hokusai Updated”. The whole story, told through masterpieces from Japan and abroad, recently discovered works, and works on public display for the first time. Mori Arts Centre Gallery, Tokyo, until March 24, 2019. 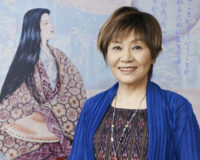 【Exhibition】Taisho Modern – Taisho Imagery and Tokyo Modern Design. 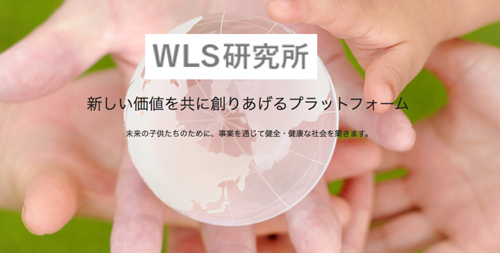 The Hibiya Library Museum until August 7, 2018.